I can’t believe this: I was just writing this article for the Bread Baking Day #23, this time hosted by imafoodblog.com, when I looked into my feed reader. And what do I detect? 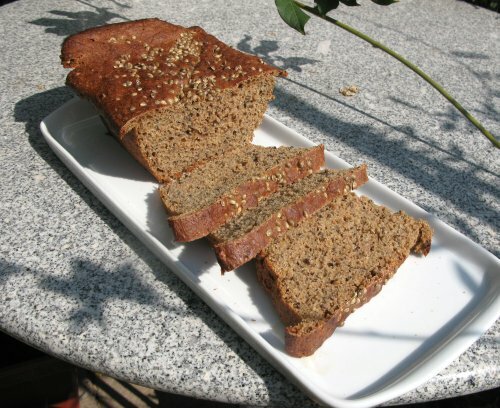 Eva of Deichrunner’s Küche has also baked a bread with hemp seed and presented it today. Quite a coincindence, isn’t it? The hemp seed I found in the organic section of a large department store. According to the brand label it should be found in Germany in almost every second organic supermarket. I always wanted to bake something with it, but somehow for the last six months I didn’t get around to it. Now isn’t this event the best opportunity to use it in a bread, which I haven’t done before? Put not quite half of the hemp seed in a mixer and ground it medium fine. Take the other half and let it soak in some milk for about an hour, then drain. Butter a loaf pan (for 500 g) and preheat in the oven at about 120 °C. Take 150 ml water and put the yeast in. Let sit for 5 minutes, then stir to dissolve the yeast. Add the melasse and let sit for another 10 minutes. Finally stir in the remaining water. Mix flour, ground hemp seed and salt in a large bowl, make a depression in the middle and pour in the dissolved yeast. Stir until the dough is strong and heavy. Keep 2 table spoons of the soaked hemp seed and add the rest to the dough. Knead it for approx. 1 minute, until it doesn’t stick to the bowl any longer. Put the dough into the prewarmed loaf pan, cover it with a clean towel and let it rise for about 25-30 minutes, until it is 1 cm above the pan. Sprinkle the remaining hemp seed on top. Preheat the oven to 220 °C and bake for about 30 minutes, then reduce the temperature to 200 °C and bake for another 15 minutes. Remove the bread from the pan und put it back in the oven upside down. Bake for another 10 minutes until it sounds hollow when you knock on the bottom of the bread. Cool for some time before cutting it. 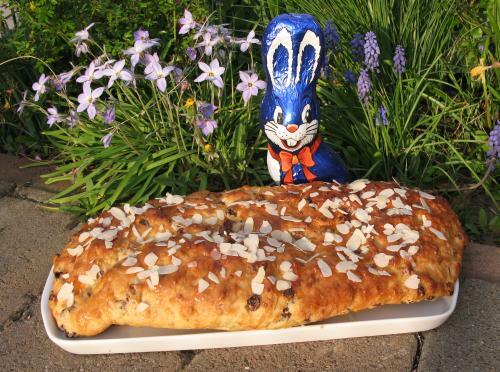 At Deichrunner’s Kitchen I found this recipe with sweet milk croissants. Right now it is très chic to copy and re-invent recipes from other blogs. This recipe has already been copied and changed in more than one recursion. So, if you sit back and take your time, you are able to get inspired by the ideas of your fellow’s ideas and still insert your own mistakes. Since I may be just in time, I would still like to participate in the 22nd Bread Baking Day, this time graciously hosted by Stefanie from Hefe und mehr . Mix all ingredients for the primary dough and let sit for about an hour. Knead well the primary dough and the ingredients of the main dough – excluding the chocolate – and let rest for 20 minutes. Divide into 8 parts and mix the chocolate into four parts. Roll each piece into a ball. Cover with a towel and let rest for about 10 minutes. Then either flatten a dough ball and firmly roll it into a croissant or let the dough ball be a ball. Cover all for about 30 minutes. Preheat the oven to 230 °C. Spread some milk over each croissant/bun. When inserting the baking tray, squirt some water into the oven. After 10 minutes reduce the heat to 190 °C and bake for 8 minutes more. 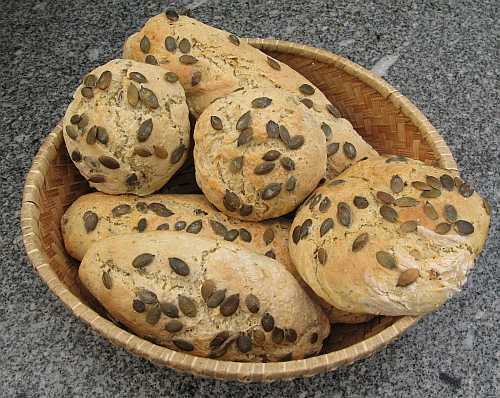 – The whole spelt flour makes the buns more compact, but gives them a slightly nutty flavour and a nice crunchy texture. For the Bread Baking Day, which has its second anniversary this month, Zorra from 1x umrühren bitte announced a pizza party. That’s nice, because we like pizza. The peppers were on sale, the zucchini was the first of a long summer full of zucchinis and the chorizo already was in the fridge for a while. Fits! 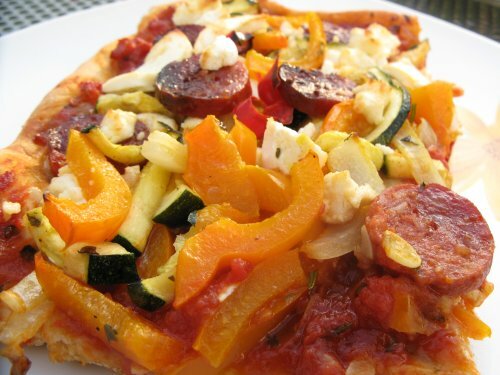 In my opinion, for a good pizza you need a good tomato sauce and should invest some time in it. So this was the most time-consuming part. But it was worth the effort. Dissolve the yeast with the sugar in the water and let rest a short while. Mix the salt and the thyme into the flour and add the olive oil. Slowly mix in the yeast water, using a dough hook first, then knead with the hands until you have a smooth, soft dough. 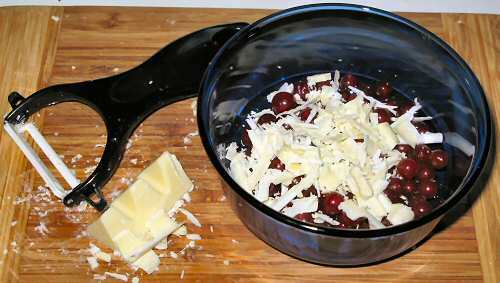 Moisten the surface lightly and cover the bowl with a clean towel. Now either put the bowl into the oven at 50° C or into the full sunshine, until the dough’s volume has doubled. Chop the onion, garlic and the fresh spices and sauté them with some olive oil. Cut the tomatoes roughly still in their cans and pour them into the pot. Now reduce the sauce in ca. 1 hour to half of its volume, stirring constantly. Season it to taste. Slice the bell peppers aund the zucchini. Cut the onion into slices and quarter these. Marinate all with some olive oil, chopped rosemary, salt and pepper. Roll out the dough on the baking tray (slightly oiled or with some baking paper) thinly. First spread the sauce evently, leaving out the edge, then add the remaining ingredients. Bake for about 15 to 20 minutes in the oven at 250° C.
– My oven has a setting „Intense heat“. I used this and the pizza was very crisp. 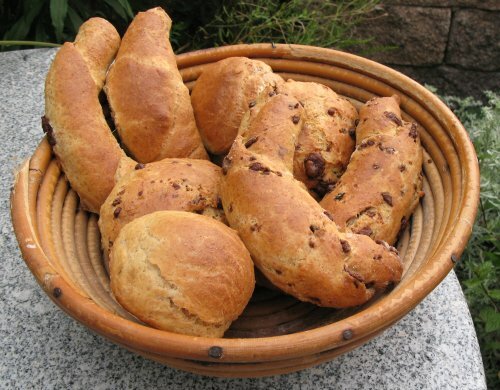 Mansi from Fun & Food Blog invites us to the 18th Bread Baking Day, originated by Zorra. She chose the theme „Quick Breads“. This is a very good idea, since I’d often like to bake a bread for dinner, but know beforehand, that I’ll not have enough time after work to let a dough rise, knead it, let it rise some more, knead it again, bake it … I think, doing this, dinner would be around midnight. So, most of the time, I simply go to the bakery and buy some bread. On the other hand, a bread where you just throw together the ingredients, give it a shake or a bit of kneading and bake it immediately is a good alternative. 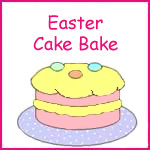 So I am quite excitedly waiting for all the other entries for this event to get new ideas to bake. The following bread was invented by Australian ‚cowboys‘ camping in the bush, who copied it from the Australian Aborigines. They baked it in the hot ash of the camp fire, most of the time without any leavening agent and no milk. Sieve meal, baking powder and salt into a large bowl. Make a well in the centre. Mix milk and oil together and add to the flour to get a sticky dough. Put the dough on a floured surface and knead for about 1 minute until it is soft and smooth. Shape the dough into a round ball and put it on a baking tray with baking paper. Brush the top with some milk and dust it with some corn flour.With a sharp knife cut the loaf crosswise, about 2 cm deep. Bake for 15 Minuten in the preheated oven (200 °C), then reduce the heat to 180 °C and bake for 25 more minutes, until the crust is golden brown and the bread sounds hollow knocking on the underside (with your finger knuckles – do not use your nose!). Let cool on a rack. – This is a very small bread for two persons. Use double quantities for a normal sized bread. – In the original recipes there is no corn flour: Either replace it with ’normal‘ flour or with wholemeal flour. 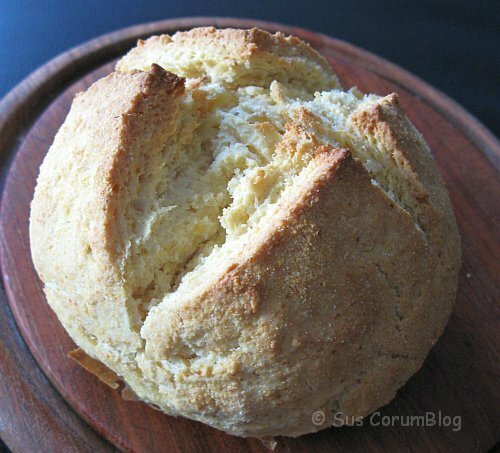 With the corn flour the bread has somewhat more flavour, but it also crumbles more easily. The current Bread Baking Day is hosted by Lien from Notitie van Lien and she wanted to see some breads with potatoes. When I made this dish, I wanted some easy-to-bake bread with it. I found the following recipe which is really very easy and only needs some time for the dough to rise slowly. Knead the ingredients together to get a firm dough. Let it rest in a cool place for some hours. Put some baking paper on a tray and spread the dough across. With the handle of a cooking spoon press some holes into the dough. Brush the surface with olive oil liberally so that some of the oil collects in the holes. Sprinkle with a lot of salt. Bake in the preheated (convection) oven for 10 minutes at 200°C and then for 15 minutes at 175°C. Yesterday I picked the very last red currants. We wanted to eat them just as they were, but instead of simply using some sugar, I got the idea to decorate them with white chocolate shavings. And being the good little food blogger that I am, I took a picture. Only after having eaten them with relish (a very nice combination! ), I remembered Zorra’s current blog event „Red, White or Swiss“. Well, we have red, we have white and the chocolate is one of the most famous Swiss chocolates: the one with the mountains. Bingo! This order of events unfortunately prevented me of taking another, nicer picture.